El S-1100 Liquid Concentrate™ de Super-Krete®, es is one of Super-Krete's most recent product developments, but it's not entirely new. It's a spin off of our original top seller, Bond-Kote(R). Bond-Kote is a ready-mix concrete resurfacing product (just add water) that is used to repair, restore, resurface existing concrete to make it look brand new. Designed to go up to 1/8", it can be applied by trowel, squeegee, sprayer, broom, brush and is extremely versatile. The Bond-Kote formulation has been proven to work in even the most extreme climates with incredible success for over 25 years. In developing Glo-Kote, we incorporated photoluminescent aggregates to the Bond-Kote formulation to add the glow-in-the-dark effect without altering the characteristics of Bond-Kote in any way. Users can expect the same results from Glo-Kote that they get with Bond-Kote, but have the added benefit of the glow effect. Glo-Kote provides full depth glow and the glow factor is seamless throughout the product. We anticipate this product to provide tremendous cost savings where it is used versus the need for electricity. Though it may not fully illuminate an area, the glow factor attributes to safety and guidance while having a nice aqua visible glow. The product is recharged continually by ambient light sources. The most effective light source is natural sunlight. Exposure to natural sunlight for two hours may yield up to 12 hours of glow at night. There is a lot of talk over how much money people will spend to have a green product. The cost of Glo-Kote is certainly not cheap, but we in no way incorporated the overall value or savings the product will bring into the cost of the material. The cost is driven by the unique raw materials used to create the glow. The best application of Glo-Kote is performed by sprayer because the greatest amount of area can be covered with this method. What is the life span of the Glo-Kote? How long does it continue to work? Since there is no chemical reaction that creates the glow  it shall never stop glowing so long as there Is a light source to charge it. The glowing aggregate is a natural product. Temperatures here in the desert reach 115 Fahrenheit in summer. According to your TDS the temperature should not exceed 100 F.
Is this only during application? Yes, during application. When it is too hot (or too cold) during application, it causes the product in wet form to dry too fast, causing cracking, etc. and also makes for a very difficult installation in handling the material. The product, once dried, can be exposed to extreme temperature conditions without any deteriorous affects. We live in a dusty city; what kind of maintenance do we need to do to Glo-Kote once it has been applied make sure it continues glowing? Always make sure it is sealed with the appropriate sealer for ease of maintenance and wearability. A typical surface should be resealed no less than every three years. One year is ideal but it all depends on the exposure to traffic and the type of traffic. Keep the area clean. Obviously if there is a spill or soil that covers the surface the glow may be prohibitive. The area will be glowing  but the dirt would need to be removed to see it (as with any surface). The walkway is near the grass and the grass is watered regularly. Does water affect the properties of Glo-Kote or its performance? Not if it is properly sealed. The water may leave deposits on the sealed surface (usually turn white) which should be removed for optimum performance (as indicate in #3). The concrete to which Glo-Kote will be applied should first be treated with Pene-Krete to decrease the moisture vapor transmission and keep any efflorescence from coming up through the slab or any water penetration. What kind of precautionary measures should be taken with Glo-Kote in general? We highly recommend surface prepation in accordance with our S-1 spec which entails ensuring a totally clean and laitance free substrate (using Heavy Duty Degreaser), a treatment of Pene-Krete, Glo-Kote application, and sealer application (2 coats of the sealer of choice see spec S-2 attached to determine the best sealer for this project). When applied by sprayer, one can cover approximately 7 square feet per 5 pound unit of material. 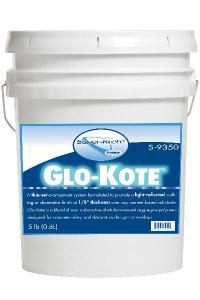 Glo-Kote will cover 1 square foot per pound when applied at 1/8".